You need design the Marketing Organization Chart and look for effective software? Now it's incredibly easy to do this in ConceptDraw DIAGRAM which was supplied with Marketing Diagrams Solution from the Marketing Area of ConceptDraw Solution Park. Marketing Diagrams Solution is rich for the predesigned samples and templates which are available from ConceptDraw STORE. Templates are very useful and convenient tool for fast and easy drawing various marketing diagrams and marketing organization chart. It is the excellent news that Marketing Diagrams Solution for ConceptDraw Solution Park contains also the Marketing Diagrams library with numerous vector objects which will afford you the real help in self-dependent drawing Marketing Organization Chart and other types of marketing diagrams. If you need, you can also use the predesigned objects from the Organizational Chart library from the Organizational Charts Solution of the Management Area. 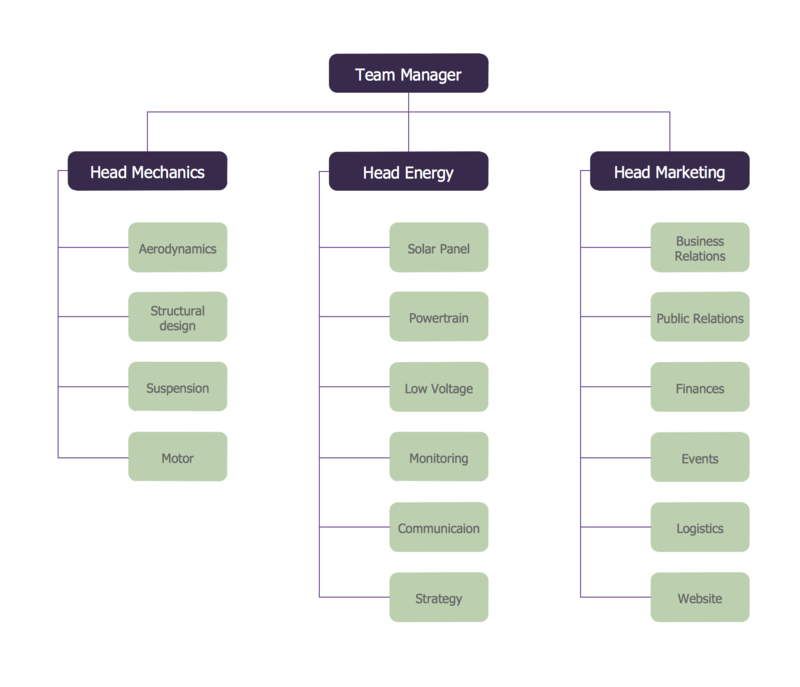 This Marketing Organization Chart was created in ConceptDraw DIAGRAM software with help of tools of Marketing Diagrams Solution for ConceptDraw DIAGRAM Solution Park. An experienced user spent 5 minutes creating this sample. 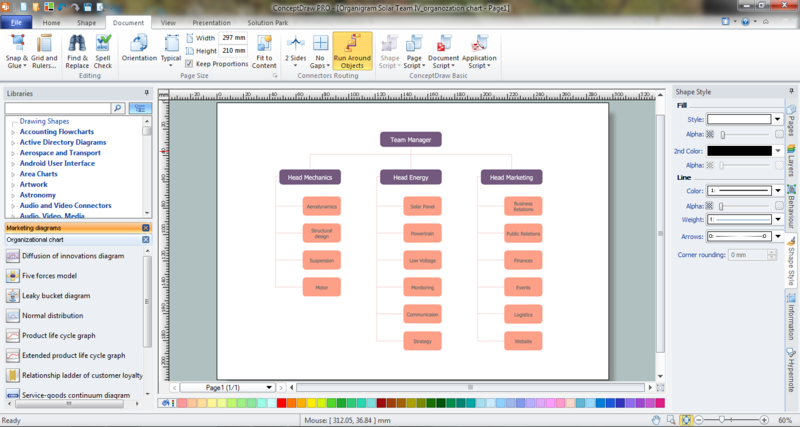 Use the powerful tools of Marketing Diagrams Solution for ConceptDraw DIAGRAM software to create your own professional looking Marketing Organization Chart quick, easy and effective, and then successfully use it in your work or education activity. You need only a few minutes to get the excellent result in ConceptDraw DIAGRAM thanks to the Marketing Diagrams Solution! All source documents are vector graphic documents. They are available for reviewing, modifying, or converting to a variety of formats (PDF file, MS PowerPoint, MS Visio, and many other graphic formats) from the ConceptDraw STORE. 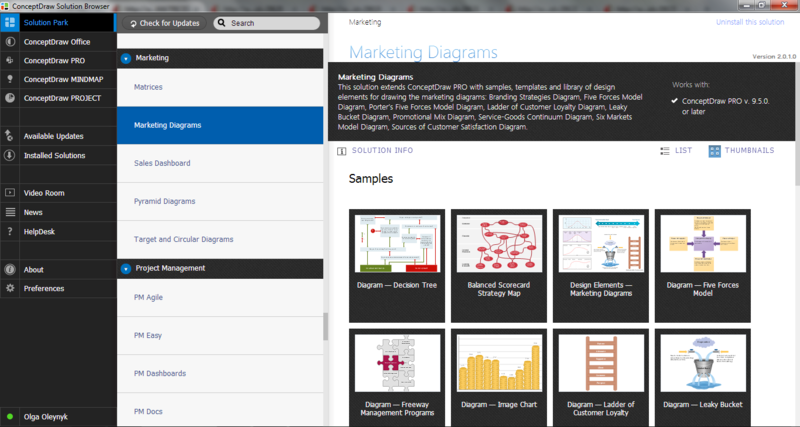 The Marketing Diagrams Solution is available for all ConceptDraw DIAGRAM or later users.